Prime Minister scoffs at the idea that western powers should soften up on Iran's nuclear weapons so that it will fight ISIS. 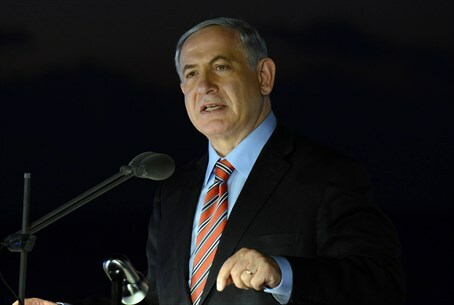 Prime Minister Binyamin Netanyahu scoffed Sunday at the idea that western powers should go easy on Iran's nuclear weapons program so that it will cooperate in fighting ISIS. Speaking at the Menachem Begin Heritage Center in Jerusalem, he said: "I know for a certainty what Menachem Begin would say about something I have been hearing more and more about in recent days from esteemed commentators in the West. “They are saying that the major powers need to go easy on Iran's nuclear program so that Iran will fight ISIS. “They are fighting ISIS for their own interests. They are fighting over who will be the ruler of the Islamist world that they want to set over the entire world. It is as if Assad would say 'Go easy on my chemical weapons. Give me back my chemical weapons so that I can fight ISIS.' Both are absurd. “Menachem Begin would reject this outright and so do I. Iran must not be allowed to become a nuclear threshold state."